Feeding female Anopheles funestus mosquito. Mosquitoes, ticks and other insects are the carriers or vectors of many diseases, including Malaria, Rocky Mountain Spotted Fever, Lyme diseas, and Zika virus. Photo by James Gathany, courtesy of the CDC. 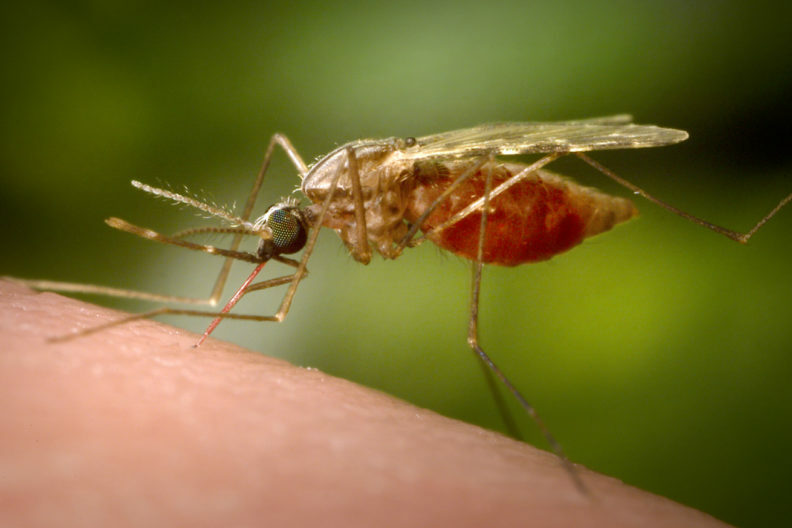 PUYALLUP, Wash. – Diseases like West Nile Virus, Zika, Rocky Mountain Spotted fever and others are carried by mosquitos and ticks, putting the health of people and animals at risk around the country. John Stark, director of the Washington Stormwater Center at the WSU Puyallup Research & Extension Center, is on a new work group organized by the Centers for Disease Control and Prevention (CDC) looking at the potential impact of those diseases and others, called vector-borne diseases, and how to prevent them. Vector-borne disease cases tripled in the United States between 2004 and 2016, including the discovery or introduction of nine new pathogens, according to the CDC. Worldwide, diseases from mosquitos, ticks and other carrying organisms kill more than 700,000 people annually, according to the World Health Organization. Stark is an environmental toxicologist and entomologist by training, so he wasn’t sure how he fit into a workgroup focused on combatting diseases that affect humans. “A major aspect of vector control is the potential human and environmental impact of widespread pesticide use,” Stark said. These diseases don’t have vaccines and could have major impacts on human health. So the group is looking at controlling the carriers, or vectors, in a variety of ways. One possible control measure is spraying pesticides over large areas: killing the vectors means the disease doesn’t spread. But the effects of this option on human and environmental health is uncertain. Stark’s no stranger to serving with important groups, as he’s worked with the Environmental Protection Agency on several issues and is currently on a panel for the National Academy of Sciences. But he’s impressed by his colleagues on the CDC work group.